If you’re in the midst of planning your honeymoon and the price tag of a tropical vacation seems a little too steep, but you aren’t exactly up for the hustle and bustle of the city, think a little outside of the box! The National Parks all over the U.S. offer gorgeous backdrops and incredible adventures for any couple looking to get past all of that wedding planning stress and enjoy newlywed life together. Take, for example, Montana’s Glacier National Park and Yellowstone - these are two of the most underrated honeymoon spots out there, and it’s easy to count them out if you aren’t really a camping kind of girl. But between their beautiful “glamping” campgrounds and stunning log cabins, the National Parks in Montana offer an absolutely breathtaking romantic getaway suitable for any budget! Although Montana is filled with acres upon acres of different National Parks, Glacier and Yellowstone are the two most popular for couples looking to add a little adventure into their vacation. Both are the perfect spot for some “glamping” - glam camping, that is - because of the wide variety of accommodations available. A week spent in a cold tent under a sleeping bag is far from romantic, but the campgrounds and cabins at Glacier National Park make your trip luxurious and comfortable - and yes, there’s electricity! If your budget is a little on the higher end, consider renting out a large luxury cabin like this one. The mountain views are like none other, and there’s a full kitchen. It’s the perfect opportunity to sleep in and enjoy some breakfast in bed with your new hubby! If you’re looking to spend a little less and go back to the basics (still comfortably, of course), check out this adorable retreat in Helena National Forest. It’s the perfect compromise for the husband looking for a little bit of rugged adventure and the everyday girl that’s a little hesitant to sleep on the ground. Cuddle up in your queen-sized bed with your hubby, look at the stars, and sip on some wine - it’s the epitome of romance and totally within the budget. The best part? If you’re feeling hungry, you don’t have to grill up any lackluster campfire food! There’s a quaint but upscale 5-star restaurant on the campgrounds. Tons of other great options dot the mountains, but be sure to grab a homemade meal at the local favorite, Russell’s Fireside Dining Room. Montana is the ideal getaway for couples that are looking for a little bit of easy living post-wedding, so take advantage of the slow pace of it all. Sip on some delicious cappuccinos at Glacier Coffee House while you watch the sun rise over the mountains. Pack up some waters and a picnic lunch, toss on your comfiest shoes, and explore until you find the best spot in the park. 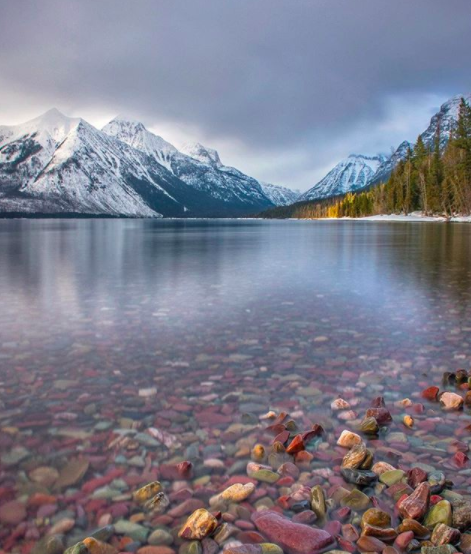 Grab a camera and capture the beauty of the jewel-toned rocks below Lake McDonald’s clear water, or follow the path of the Bozeman to Norris Geyser Basin. Set aside a day to road-trip down the Going-To-The-Sun Road, a gorgeous stretch of highway that passes everything from glacial lakes to spans of forest. No matter how you spend it, Montana’s National Parks are the perfect budget-friendly spot to slow down and getaway with your honey for a little while.